Berkshire Hathaway often stays away from healthcare stocks, but that's not the case with this stock. Pricing pressure, competition, and massive debt have taken a toll on Teva Pharmaceutical Industries (NYSE:TEVA) in the past year, yet Warren Buffett's Berkshire Hathaway (NYSE:BRK-A)(NYSE:BRK-B) has bought millions of shares in 2018, including 2.7 million shares in the second quarter alone. Is Teva Pharmaceutical a bargain-bin buy you should add to your portfolio, too? A value investor, Buffett favors companies with strong long-term tailwinds that have fallen victim to short-term struggles. Teva Pharmaceutical's slate of bad news over the past year certainly qualify as setbacks, one of which was self-inflicted. In 2016, it orchestrated a monstrous deal to acquire Allergan's generic-drug business, a move that caused debt to soar just as growing generic drug competition and payer scrutiny crimped drug prices and thus generic drug revenue and profitability. A less attractive pricing environment for generics wasn't the only blow to Teva Pharmaceutical, though. It also had to cut prices on its best-selling multiple sclerosis drug, Copaxone, to maintain market share after Mylan Labs won Food and Drug Administration approval of a Copaxone biosimilar last fall. The double whammy has caused Teva's sales, operating margin, and net income to tumble. For instance, sales fell 18% year-over-year to $4.7 billion and adjusted net income fell 23% year over year to $794 million in Q2 alone. Pricing pressures caused generic drug sales to fall 29% while doctors shifting to Mylan's lower-cost version of Copaxone caused a 46% decline in Teva's North American Copaxone sales to $464 million. Although Teva's financials are struggling, a restructuring could cut $3 billion from costs next year and Teva Pharmaceutical's full-year guidance for 2018 still calls for the company to turn a profit, after adjusting for one-time items. If Teva Pharmaceutical can orchestrate its turnaround successfully, its sales stabilize, and it can reduce the burden associated with its $28 billion in long-term debt, then a good argument can be made that now's a very attractive time to consider adding its shares to portfolios. As you can see in the following chart, the company's shares haven't been this cheap on price-to-sales or price-to-book metrics since 2000. TEVA P/S Ratio (TTM) data by YCharts. That's probably the calculus behind Berkshire Hathaway's interest in Teva Pharmaceutical's stock. 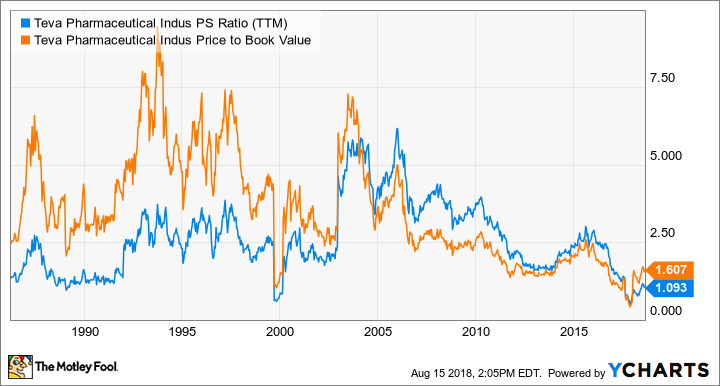 It's no secret Buffett is a fan of using price-to-book ratios to value companies and it stands that he's instilled the importance of that measure to Berkshire Hathaway portfolio managers, Todd Combs and Ted Weschler, the two likely responsible for buying more Teva Pharmaceutical shares for Berkshire Hathaway's portfolio in Q2. Can Teva Pharmaceutical turn it around? After news Berkshire Hathaway had bought shares, Teva Pharmaceutical shares have shot up over 80%. Yet, Berkshire Hathaway's buying last quarter suggests someone there believes Teva's stock has more room to run. The company thinks about half of its planned $3 billion in annual savings from its restructuring should be achieved this year, with the remaining savings realized by the end of next year. The cost-cutting alone won't offset all the risk to Teva Pharmaceutical's because Copaxone's still selling at $2.4 billion annualized clip worldwide and generic drug price pressure isn't going away, but it's a good start and it could make the company much more profitable in the future when Copaxone sales eventually find their floor, allowing new drug launches to return the company to growth. Among the drugs that could help sales and profit recover, investors will want to keep a close eye on Austedo, fremanezumab, and fasinumab, which it's co-developing with Regeneron Pharmaceuticals. Austedo won approval for tardive dyskinesia and Huntington's disease last year. Its sales were $44 million in Q2 and Teva Pharmaceutical's aiming for $200 million in revenue from it this year. An FDA decision on fremanezumab, a migraine drug, was delayed earlier this year, but a go/no-go should happen in September, and if it's approved, it could be a nine-figure drug. Also, Regeneron says results from a phase 3 trial of fasinumab, an osteoarthritis pain drug, will be released later this quarter, and because pain treatment is a multibillion-dollar market, a win there could help boost sales someday, too, if it secures a regulatory OK. Overall, the U.S is spending over $330 billion on prescription drugs every year and generic drugs, including those made by Teva Pharmaceutical, remain one of the most important weapons in the battle to rein in future spending growth. Forecasts suggest aging baby boomers will increase U.S. healthcare spending toward 20% of gross domestic product by 2020, up from 18% today, and since average prescriptions per capita for the elderly are roughly twice that of the average American, there's reason to assume Teva Pharmaceutical will see plenty of demand for its products in the future. Admittedly, it's anyone's guess when Teva Pharmaceutical will be back on track, but long-term investors like Berkshire Hathaway seem increasingly confident it's only a matter of time.